Overall, the hotel was excellent for the price. We don't typically stay at a Fairfield Inn for an extended period of time, but it does compare favorably to some of the places we've stayed in the past. It was an excellent hotel overall. The location was great -- a little hard to find at first -- make sure to look for the Residence Inn sign when looking for Canada Avenue. The breakfast was wonderful -- something for everyone. The pull-out was not the most comfortable. 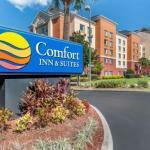 The 133-room Fairfield Inn and Suites by Marriott Orlando International Cove provides quality accommodation at an affordable price for both the business traveler and families on vacation. The five-story non-smoking hotel is located in the International Drive Resort area and close to the Orange County Convention Center. Items included with the room rate are an expanded continental breakfast, high-speed Internet access, parking, local telephone calls, a morning newspaper and coffee available in the lobby 24/7. The property is within driving distance of all the Orlando theme parks, five golf courses and shopping either on International Drive or at the Mall at Millenia and the Florida Mall. All the guestrooms, and 67 suites, have a work desk with high-speed Internet access, two-line telephone with voicemail, coffee and tea making facilities, cable television with movie and news channels, pullout sofa bed, iron and ironing board, alarm clock and a hairdryer. The suites have a spacious living area, partially separated sleeping area and a microwave oven and mini-refrigerator. The hotel has an outdoor heated swimming pool, whirlpool and a fitness center. There is a YMCA Aquatic and Family Center a mile from the property. The hot breakfast, with the Jimmy Dean breakfast sandwich, is the only meal served here but there are numerous places to eat close by. The 24-hour front desk has safe deposit boxes and information on all the Orlando events and attractions. The hotel has a games room, valet dry-cleaning service, coin-operated laundry, copy and fax machines for guest use and vending machines. Many travelers rate this as their favorite place to stay in Orlando. The rates are good, the accommodation modern and spacious and the employees attentive, helpful and friendly. The location is great for all the activities along International Drive and it is a short drive to all of the theme parks including Mickey at Walt Disney World and the splashing fun at Wet 'n Wild. The property gets a lot of repeat customers which is a good recommendation.